A report on the Food justice seminar, University of Sydney’s Sydney Environment Institute. 24 September 2015. AS DARKNESS SET IN on a cold and rainy Spring evening, people streamed into the Sydney Environment Institute’s seminar on food justice. They came from food advocacy organisations, community gardens and a range of other interests to hear three speakers try to link the academic discussion around food justice with the people on the streets making it happen. Doing that might sound easy but there exists a gap between university academics and the public active in these issues. Universities are commonly viewed as remote from people’s everyday life unless they have some association with them. Researchers might descend upon some community garden of other enterprise from time to time to ask numerous questions, yet applying their findings to improve how those enterprises operate has been stymied by a lack of effective communication between the two. With University of Sydney professor, David Schlosberg, PhD student Luke Craven and Sharelle Polack, a community gardens team leader with Cultivating Community, the Melbourne NGO contracted to the state government to deliver community garden and food systems services to mainly social housing residents, there was a good cross-sectoral link between academia and community. Introducing the evening was Luke Craven whose PhD research focuses on the delivery of foods security programs to low income areas. He opened the seminar by reminding the audience how new the community food movement is. “If you do a Google search you find that the term ‘food justice’ didn’t exist before 2007”, he told the audience. Now, there are an increasing number of organisations around food production, distribution, food waste, the availability of quality food and the building of local economies, he said. 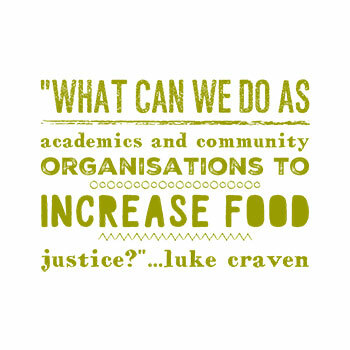 “What can we do as academics and community organisations to increase food justice?”. The date Luke puts forward is interesting because it is about the time that the Sydney Food Fairness Alliance, which has a focus on food security and health and includes community and health education workers in its membership, started to expound its call for a NSW food council and a state food policy, and started to use the term he describes at that time. David Schlosberg is interested in what motivates people to act locally on issues like food rather than globally on policy and the like. He spoke of how the movement, which he calls the ‘community food movement’ as do others, articulates a broad range of issues including individual and community health, a sense of community, social justice in the form of food justice and responses to economic and political power including resistance to it and to some corporations. “People see all these things as tied together… as self-reinforcing. Justice means different things. In the environmental justice movement is means equity, distributional justice, procedural justice and basic needs. “It’s the same with the community food movement though it is less so about equity, which may have to do with it being a middle class movement, and includes participation, inclusion, involvement, power and resistance to it”. The movement, he said, has arisen as a response to the feeling of alienation from and the industrialisation of food. As for health, he said, there’s the notion ” …that food systems can add to the health and vibrancy of a community as a whole”. 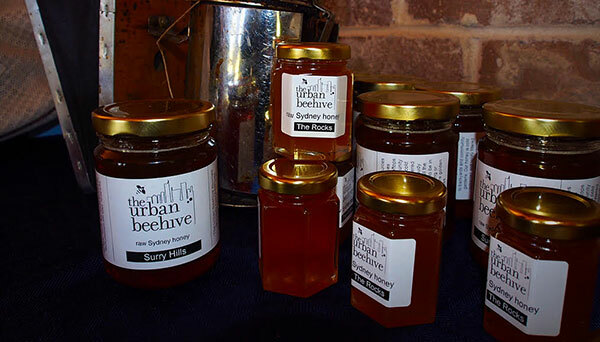 Building the regional food economy… Yhe Urban Beehive is a small honey business producing honey in Sydney’s suburbs and the CBD. By supplying pure honey, proprieter, Dour Purdie, utilises local resources for local markets. David said the movement regards the concept of community as something enabling, at the same time a subject and an agent of justice… “as a connective tissue that bind people and their varied concerns around justice together”. Community, he said, is seen as a way to obtain justice. “There is a fundamental need for people to have a say and to do”. “It was surprising how Australia’s supermarket duopoly (Coles and Woolworths) came up during research”, he said in reference to showing resistance to food corporations. “It is not just about replacing food purchases but about replacing the food system. It is about the new flow of food, not about individual action but about the flow of power”. During question time someone asked about local economic development and food systems. 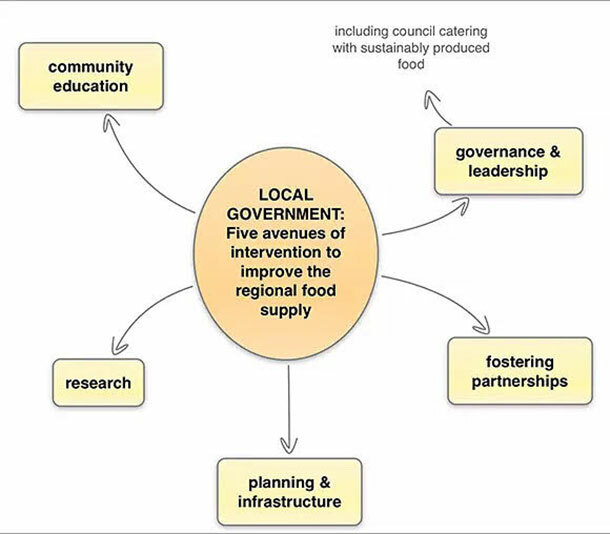 David said that some city governments in the USA have taken steps towards local economic development and food systems but that isn’t happening in Australia. The City of Sydney, he said ” … is really supportive of community gardens, urban gardens and the urban farm and all that, but it seems like it’s much more of a hobby thing than it is about real economic development or food security”. At a community consultation about adaptation strategies David was working on he found that for the public food security was important… ” …growing more food in Sydney”. “The City, let’s just say did not take that one on board… and it’s because they did not want to take on the responsibility for foods security. Had the public, I think, articulated it in a different way… local economic development, value-added products… that might have been a way to get that policy in. It needs to be articulated in different ways that local governments can catch on, not articulated in ways that freaks-out local government. For the City, food security was the responsibility of the federal government”. Ideas for local goverment coming from the 2013 Securing Our Food Future seminar at Blacktown Council. Sharelle Polack, from Cultivating Community, explained how the organisation came into being in the 1990s and now works with 21 community gardens and 800 households in the Inner Melbourne area. The people it works with, she said, are socially isolated, have poor English language skills and live with economic and health issues. Cultivating Community also runs a schools’ food garden program and a community kitchen that social enterprise and food educators book time for training sessions. They also work on food waste solutions. “Food is quite an amazing vehicle to deliver a range of objectives”, she explained. “That can be a challenge and a barrier sometimes when you’re dealing with local government because you’re dealing with all of its sections”. There is a great need for the movement to communicate between its parts. The community gardens, Sharelle said, get people growing food. “What we find is that they do so much more than that. Time and again we’re told about the health and wellbeing impacts on people. “People in the towers, some are 20 stories high, are individually isolated in their units and the estates they live in are isolated from the community. The garden is an excuse for them to get out and interact with people”. And it’s here that underfunded and under resources NGOs like Cultivating Community run into a barrier: how do you evaluate your work and learn from it? “Food projects get great outcomes by people coming together and sharing, But they don’t know how to maximise those benefits and identify learning for new food projects. We don’t collect data on community food systems. We know they have an economic impact but it is not quantified. Therefore, we have difficulty selling them to economists”. There has been much talk of the need to evaluate and learn within the international development industry where it is said that agencies spend much time actually doing the work but too little evaluating what they do. I learned the importance of evaluation and the organisational learning that comes from it when a program manager for an NGO engaged in food security and agricultural training projects in the Solomon Islands. AudAID, our donor organisation, expected regular project monitoring reports and an end-of-project evaluation. Fortunately, we could include those the costs of doing that in our project applications. Small NGOs and community organisations aren’t so lucky. The need to evaluate and learn has been a long-running topic in the permaculture design movement too. Practitioners run numerous small scale projects and the practice as a whole would benefit from having systematic project evaluation reports to learn from each other’s experience. Evaluating what they do is a perennial problem for small NGOs and community organisations, yet without it there is only observation and guesswork to suggest why projects succeed and fail and to identify what was learned so that it can be used in future projects. Sharelle’s comments on the need to evaluate rang so true for me. 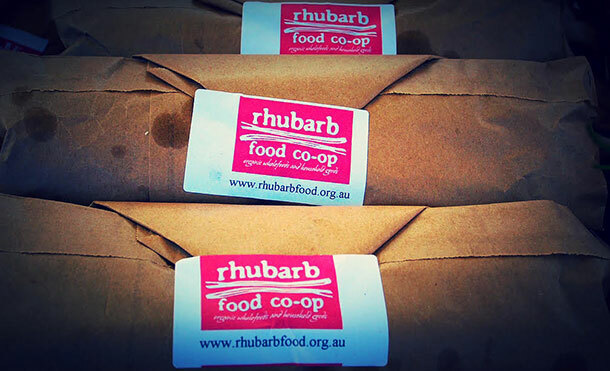 Bulding the regional food economy… like other food co-ops, Rhubarb Food Co-op operates as a social enterprise, a not-for-profit business model. Co-ops and organic food buying groups supply affordable organic food to members. 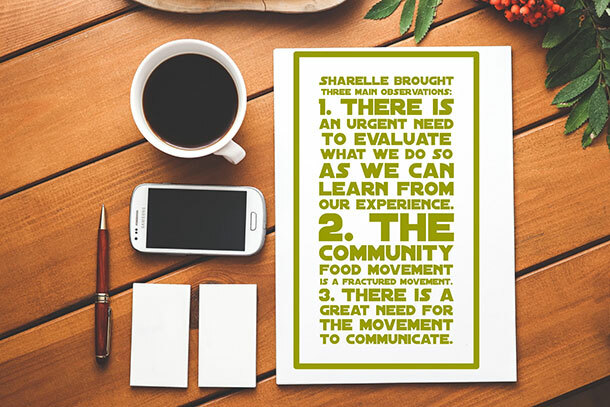 Luke Craven had earlier said that as a community food movement we don’t address issues as a united front, a finding echoed by Sharelle when she described the community food movement as fractured. She said we need to communicate beyond the movement. Similarly, we need to talk more frequently with those within the movement, she said. Doing that will be necessary to building cohesiveness. Looking around the audience I could identify people from the Sydney Food Fairness Alliance, some from the Australian City Farms & Community Gardens Network and the Australian Food Sovereignty Alliance. Those were key people when it comes to a seminar like this as the researcher’s findings reflect their work back to them. And were alliances to form, they are the people who could take the researchers’ findings into the gardens and into our communities. Luke earlier said that the term ‘food justice’ didn’t exist before 2007. I don’t know if that is true or not but what he was getting at was true — that food has fast become an economic, political, health and democracy issue. He could also have said that there wouldn’t have been a seminar like this before 2010, the time when notions like food security and food justice started to be increasingly heard. What the seminar demonstrated is that there can no longer be any question as to whether a community food movement exists. Those of us who have been involved in it for some time know that as a truth. Now it is becoming evident to business, government, the public and to academics. And that is a good thing.